Nothing says summer like an outdoor barbecue. In fact, on Memorial Day, Independence Day, and Labor Day, approximately 75% of Americans enjoy cooking out. Barbecue is one of the most traditional foods in the United States. Barbecuing is a cooking method in which food is cooked slowly over low, indirect heat. The meat is generally smoked, which is the process of flavoring food by exposing it to smoke from smoldering material such as wood. Grilling — a similar method that many also refer to as barbecuing — is generally smokeless and cooks food over direct, higher temperatures. The “barbecue” may also refer to the actual smoker or grill or describe the social event itself. 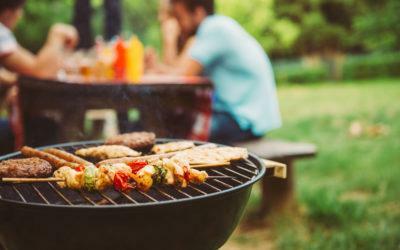 And while barbecuing is associated with summer holidays, outside barbecues range from small informal get-togethers to large group celebrations and may occur all summer long. In addition, many competitions have popped up across the country to determine which grill-masters can claim barbecue bragging rights. With summer in full swing, you may already have a number of barbecue-type social events on your calendar. If so, it is a good idea to take some time to plan for those activities. Doing so will keep you happy by avoiding any negative impact on your blood glucose control. Consider these healthful suggestions to help you stay on track with your meal plan during barbecue season. Barbecues are centered around eating, so food is often overabundant. The amount of food you eat — that is, the portion — is as important as the type. The Create Your Plate method designed by the American Diabetes Association can help you stay within recommended amounts of certain types of food (see “Create Your Plate”). Start with a plate that is nine inches in diameter. With this method, you will draw an imaginary line down the center of your plate. Next, picture another imaginary line equally dividing one half of the plate. You will now have three sections on your plate. The largest section should be filled with non-starchy vegetables such as lettuce, spinach, broccoli, cauliflower, peppers, and tomatoes. The two sections on the other side each make up one-fourth of the plate. Put grains and starchy foods such potatoes, pasta, peas, beans, and corn in one of the sections and protein in the other. Fruit and dairy can be added as your individual meal plan permits. Some disposable plates are already divided into the three sections to help keep serving sizes reasonable. Before you start to create your plate, take some time to look at all the foods available so you can focus on the healthier options first. When you fill your plate, be sure your serving of food is no more than two inches high. Most cookouts last several hours, so pay attention to the time and try to eat within an hour of your typical mealtime. Meat is usually the mainstay of a traditional barbecue, so be prepared to make the healthiest choices. First off, stay lean by choosing meat with no skin or breading. If the skin has not been removed prior to grilling, simply take it off before eating to help you lower the fat content. Grilled chicken, turkey, and fish can be tasty, nutritious choices. Bring your own burger — choose ground meat that is at least 90% lean. Hot dogs, brauts, and ribs typically are higher in fat even when grilled. If you choose these items, contemplate putting a small portion in your protein section and then rounding out that section with a lower-fat option. No matter what meat you eat, stick with a one-serving portion — equal to about three to four ounces, about the size of the palm of your hand. If you are a fan, the mouthwatering taste of barbecued fare right off the grill is hard to forget. Familiarize yourself with the nutrient content of barbecue sauces because they typically contain carbohydrate. A serving size of barbecue sauce is typically two tablespoons. If you stick with that amount, it probably won’t add significantly to your total carbohydrate count. However, when someone else is in charge of the grill, the amount of sauce used may be a mystery. Also, many people make homemade barbecue sauce, bolstering the flavor with carbohydrate-containing ingredients such as honey, molasses, brown sugar, marmalade, and even regular soda. Don’t be shy — ask that your meat and vegetables be grilled without sauce and then measure out your sauce and add it. This way, you can control the amount and still savor the flavor. With so much food around, it is not uncommon to graze. Eating smaller amounts is a good thing; however, eating all day long is not. Items like chips, crackers, beer cheese, and spinach dip can quickly add up to excess carbohydrate, fat, and calories. Volunteer to bring a vegetable tray with a healthier dip such as hummus or guacamole. Non-starchy vegetables such as celery and broccoli can be substituted for chips and crackers. Measure your dip of choice by placing a small amount on a snack-size plate. Also, data suggest that the further away you stay from the table, the less likely you are to overindulge. So park yourself closer to healthy foods and away from those you want to avoid. Hands down, the best choice is water. Water is calorie free and important for staying hydrated, especially during hot summer days. Try adding a lemon or lime wedge for flavor. Water infused with foods such as cucumber, berries, or lemon can be tasty while adding few or no calories. If you prefer, diet or sugar-free beverages and unsweetened tea are often low in calories and carbohydrates as well. If you choose to enjoy an adult beverage during the event, do so in moderation, which is generally considered no more than two drinks per day for men and one drink per day for women (see “Standard Drink Size Chart”). To minimize calories when choosing a mixer, use a sparkling water or diet drink to complement the alcoholic spirit. Avoid drinking alcohol on an empty stomach; doing so will cause you to become intoxicated faster, and drinking on an empty stomach heightens the risk for hypoglycemia (low blood glucose) in people with diabetes. When you have diabetes, you are well aware of the importance of keeping the carbohydrate content of your meal in check. Paying attention to carbohydrate will help you avoid unnecessary ups and downs in your blood glucose levels. If you don’t already have one, think about adding an app to your smartphone that provides the nutrition content for food items. You may want to ask your diabetes care team ahead of time for a recommendation of a reliable app to help you keep track. An app can be especially helpful for estimating the carbohydrate content in foods before you eat them and avoiding spikes in your blood glucose. Pick and choose carbohydrate-containing foods with care. If you are eating a 3- to 4-ounce hamburger or hot dog, keep in mind that eating it with a bun will typically add at least 30 grams of carbohydrate to your meal. Why not a naked burger (one without a bun) or only a half bun instead of a whole one? When it comes to vegetables, non-starchy is better when you have diabetes because they are lower in carbohydrate (about 5 grams per serving) than their starchy counterparts (about 15 grams per serving). Beans are a popular side dish at barbecue events. Many beans are rich in nutrients such as soluble fiber; however, keep in mind that a third of a cup of beans equal about 15 grams of carbohydrate. A typical baked bean dish often contains ketchup, brown sugar, and bacon, so be mindful of the additional carbohydrate and fat if you’re adding this choice to your plate. And be wary of the salad selection — salads with fruit, potatoes, peas, or noodles can quickly fill up your grain/starchy section. Before you load up your plate, step back and remember your total carbohydrate goal and then make your choices accordingly. Fruit can be a nutritious choice, but don’t forget that a serving contains approximately 15 grams of carbohydrate. Avoid choices that are sugar-laden and contain heavy crusts that will add to carbohydrate intake. Instead, add a tablespoon of low-calorie yogurt or whipped topping to your serving of fruit as dessert and stay away from the less-than-healthy dessert table. It is no secret that barbecues tend to be overloaded with foods high in sugar, salt, fat, and calories. Take some time to develop a strategy for healthy eating beforehand. Do yourself a favor and bring your own dish (or two) so you can be confident of the nutritional value. And by all means, join in the backyard fun by participating in physical activities that help counterbalance the effects of your barbecue meal. Laura Hieronymus is a doctor of nursing practice and master licensed diabetes educator. She is the associate director of education and quality services. Janet Gilligan is a registered dietitian and master licensed diabetes educator at the adult endocrinology clinic. They are at the Barnstable Brown Diabetes Center at University of Kentucky in Lexington, Kentucky.